Though undersized for a middle linebacker, some project the Pac-12 defensive player of the year as a Day 2 pick in next spring's NFL draft. Ben Burr-Kirven was always hopeful he would get a chance to play in the NFL. More and more, that dream looks like a sure bet for the Huskies’ senior linebacker. At 6-feet and 221 pounds, Burr-Kirven knows the one knock on him is his size. He’s not the archetype of an NFL middle linebacker. But he’s more than made up for whatever shortcomings he might have with his production — and his sterling off-the-field resume — for the No. 9 Huskies this season. As he leads the Huskies into the Rose Bowl against No. 5 Ohio State, Burr-Kirven leads the nation with 165 tackles, more than any Husky player has had in nearly 30 years. “People always underestimate me because of my size, but I’m a pretty good athlete too,” Burr-Kirven said this week. Pro scouts have taken notice. One NFL scout told The Seattle Times that he has graded Burr-Kirven as a fourth-round prospect. Burr-Kirven figures to make his mark on special teams in the NFL, at least initially — as he did his first three seasons at UW — and he could wind up as a hybrid safety in some NFL schemes. On Thursday, Burr-Kirven was named the Associated Press’ Pac-12 defensive player of the year, two days after being recognized as the Pac-12’s Pat Tillman Defensive Player of the Year in a vote of league coaches. Last week, he was named the Pac-12 football Scholar Athlete of the Year, making him the conference’s first football player to win both major awards for his play and his academics. Burr-Kirven has a 3.69 grade-point average in UW’s cinema studies program, and he has one last final to take next week to complete his undergraduate degree. After his football career, he is interested in working in Hollywood, perhaps as a film writer or director. Various mock drafts project UW cornerback Byron Murphy as a first-round pick next spring, and Solak ranks Murphy as the Pac-12’s No. 1 prospect overall. 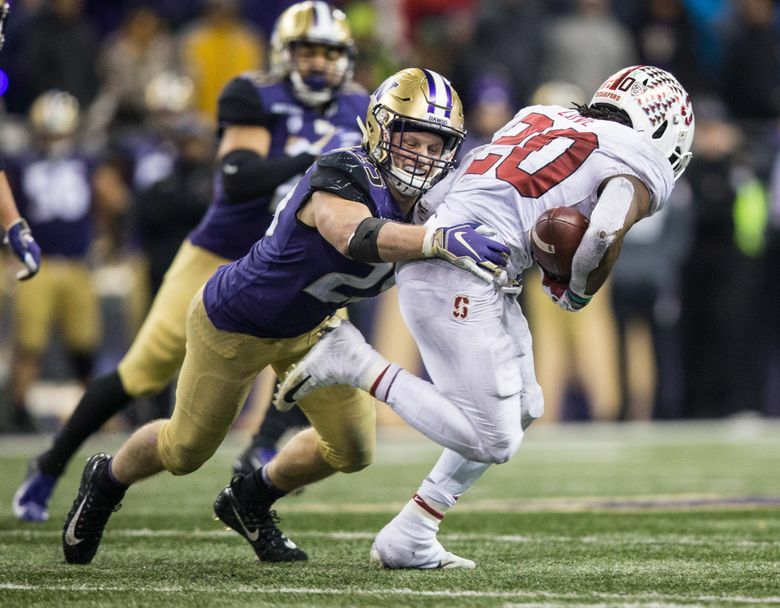 As a third-year sophomore, Murphy is eligible for the 2019 NFL draft, should he opt to leave UW early. “Quick, disruptive, and instinctive, Murphy may challenge for CB1 if he enters this class,” Solak wrote for TheDraftNetwork.com. Junior safety Taylor Rapp is in a similar situation as Murphy — a potential early-round draft pick who is believed to be considering an early jump to the NFL. Solak is also high on another UW defensive back: junior Myles Bryant. A former walk-on, Bryant was named to the all-Pac-12 second-team defense this week, and he too is thought to be considering an early entry into the draft.